The Traeger pro series 22 review was not an easy one to do. I had a lot of questions to begin with and not all have been answered yet. I am still doing research and will update this review on a regular basis and after contacting Traeger customer services with the questions I got left. 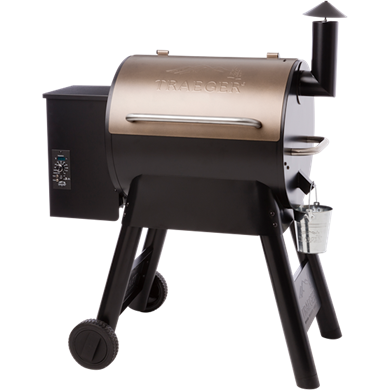 This is what I have found out about the Treager pro series 22 pellet grill. One of the most important things to know when looking for a grill is the grill surface. If you adhere to the general rule that you need about 72 square inches, and apply this to the Traeger pro series 22 that comes with a 418 square inch grill grate, you can safely grill for a family of 6 on it. The secondary grill rack of warming rack adds an extra 154 square inches and this brings the total to 572 square inches. That is a little over 300 square inches less than the Traeger pro series 34. The second thing I am always interested in is the material of the grill grate. Some materials rust fast or are hard to clean. I was happy to see in the Traeger pro series 22 review that they come with my favorite: Porcelain coated grill grates. Let’s have a look at some of the main features. Later I will have a better look at some of them. Customer reviews can be a valuable way of finding out a lot of things in any grill review. The Traeger pros series 22 review is no exception. I been visiting several sites, forums and consumer website to find out more and here you can read what buyers have to say about this pellet grill. The new sawhorse construction is added a lot of stability compared to the older model and the large lift bar made it even easier to move around. These pro series are a very good upgrade of the elite series and they have added some great features like the removable warming rack, the easy to clean out hopper and the dual probe thermometers that you can use to monitor two pieces of meat at the same time. The grill is very well packed on a wooden pallet and in a cardboard box with a lot of foam support in the box, but still I read several people talking about it arriving damaged. There is a learning curve in using this Traeger pro series 22 grill. One tips was to buy a good pellet grill cookbook and stick first to the settings in the recipes. Although in the name it is mentioned as a grill there are several times I read that it does not get hot enough for a good sear like from a charcoal or gas grill. Keeping the temperature consistent is better when you do not open the lid and even better if you use a grill blanket. Sometimes before making a buying decision your are overwhelmed with information. Reason for me to help you with a simple overview of the pros and cons I found in the research I did. After doing the Traeger pro series 22 review I still have some unanswered question and not formed an opinion that I can fully support by facts. I still see a lot of low ratings, but also many high ratings. It is not clear to me if this is the new PID controller or the old PD one that does not is to accurate in keeping the temperature steady. Overall I can say the The Traeger pro series 22 pellet grill is a fair priced smoker but you get what you pay for. What amazed me that on websites from most online stores, including the Traeger website, the review averages were a lot higher than in independent sellers website like Amazon. Steady temperatures is always a complaint I read in all pellet grill reviews I did. The Traeger pro series 22 review shows the same thing, but sometimes worse than some other brands. This has always been a Traeger problem, but I see better results with the newer controller. I wrote a guide on how to replace a Traeger controller and how this can be done in 10 minutes. Recommendations from us on other products and Traeger pro series 22 accessories to make it perform a lot better and easier. <="" h3="">The bottom shelf give you extra room under the grill to use as storage. With these very cheap drip pan liners all you have to do is throw them away after use. No cleaning of the bucket itself. A grill cover is a must for any grill and the Traeger pro 22 is no exception. This one came pretty well recommended. With lower temperatures it is best to use a grill blanket to help keep the heat in the smoker. Keep your eye on the grill. The set and forget is not really true. I hope you find all the answers you were looking for in this Traeger Pro series 22 review. If you have any additional information or need answers feel free to contact me.